An electric griddle can be your kitchen’s best friend. 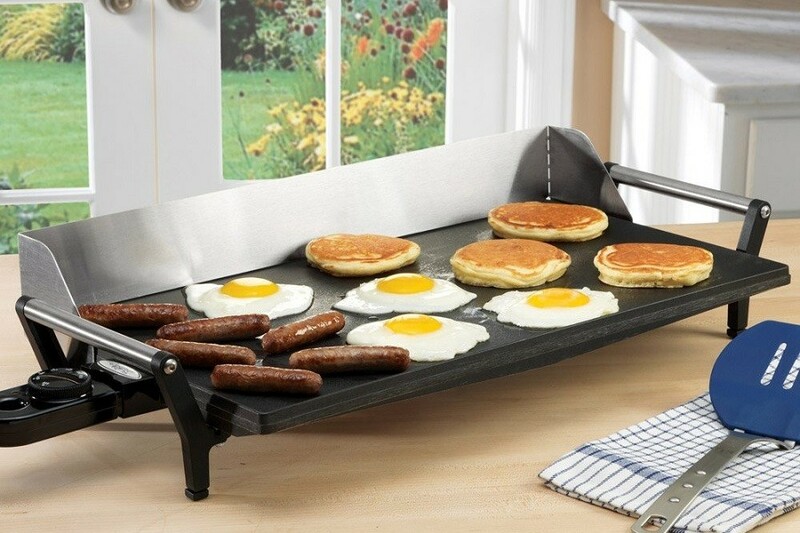 If you love eggs, bacon, and pancakes as much as we do, then your cooking griddle will likely become family. Just because it is best for breakfast food doesn’t mean you can only cook breakfast food. Griddles are also great for sandwiches, vegetables, stir fry, as well as several desserts and pastries. The griddle is the ultimate tool for cooking your breakfast favorites, but there are several different types of griddles ranging from a large electric griddle to a basic griddle top. 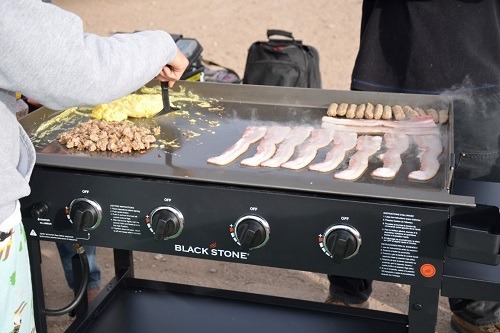 Most every griddle grill was made with a specific niche in mind. There are various types of griddles and within each category there are more divisions. Understanding the differences will help you best suit your needs. There are many different types of griddles. Gas griddles are the ones you mostly see in diners, but the 3 most common household griddles are stove top griddles, panini grill griddles, and electric griddles. This article is dedicated to the latter, but it still helps to know what your options are. The stove top griddle is likely the griddle your parents used when you were younger. They are made of either aluminum or cast iron and you place them right on your stove. They are more or less thicker cookie sheets and they aren’t terrible. They charr food more than an electric or gas griddle and usually smaller. They are generally difficult to clean as well. They are cheaper than their more advanced counterparts, so if you are someone who likes but doesn’t love breakfast food (who are you?) yet still wants the ability to make a small amount from time to time then a stove top griddle is likely for you. Visit our double burner griddle for glass top stove for great options. The gas griddles are the powerhouse griddle stoves you see at diners. They may cook the best and have the largest surfaces, but they are also much more expensive. A good one will cost you a few hundred dollars minimum. They requires gas, so you will likely have to buy an outdoor griddle grill. Most apartment complexes don’t allow gas, so these griddles are mostly for restaurant owners. There are much simpler versions that still give you mass and effective cooking in the electric griddle. 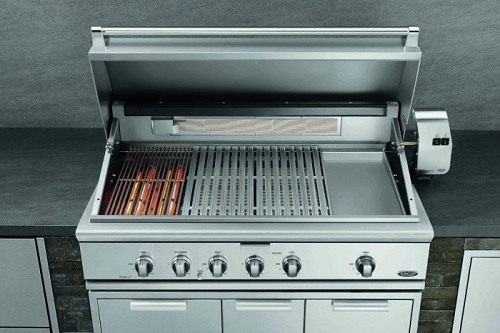 You can check our Good Gas Grill Brands for more information. 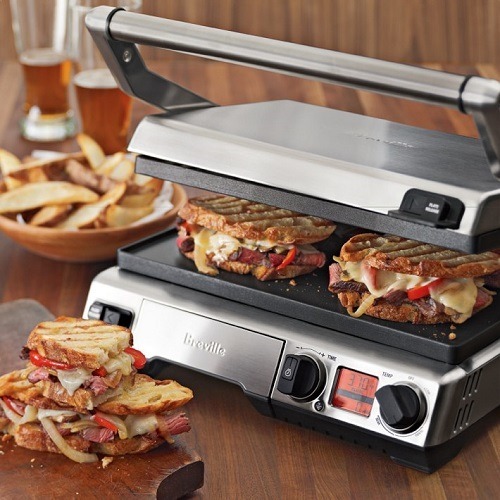 The panini griddle grill is mostly suited for making paninis, as the name reveals. You can make breakfast food with it as well, but it’s not what the main intention is. These have a wide price range and you can find one for very cheap and very expensive as well. 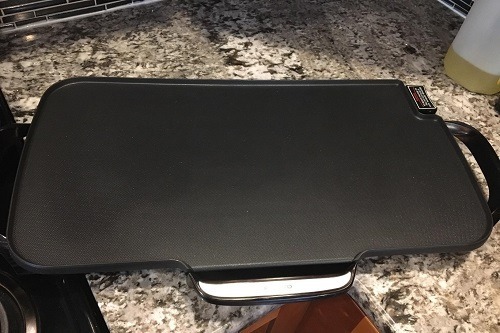 They are amazing for sandwiches, waffles, and crepes, but for the creme of the crop (bacon, eggs, and pancakes) you will want a standard griddle. 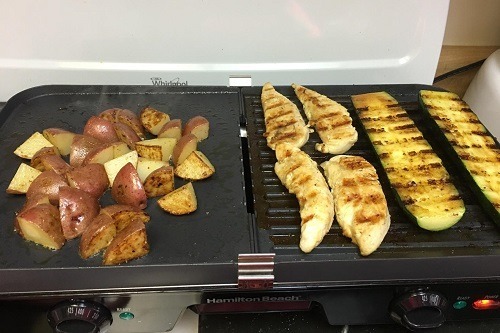 The panini griddle grill is more suited for a college type lifestyle where you mostly need a sandwich on the go but also want the ability to cook some bacon when needed. Electric griddles are the best griddle for households. For starters, they are portable. You can put them anywhere that is near an outlet and then you can store it away. The temperature heats up quick and self regulates, and most are non stick so you don’t really need to use grease. They can be large, and you can cook a meal for the entire family at the same time. You can even get griddle grill combinations. If you are looking up griddles online, most likely an electric griddle will be what you are looking for. For that reason we have further split up the different types of electric griddles below. We hope we can help you find the perfect one for your kitchen. We have assembled 8 types of electric griddles that we think will include the best electric griddle for you. They range in price, quality, and material so surely one will fit you needs. This category covers all the bases. It comes in at a mid tier price of around 60 to 80 dollars, but offers the quality of a more expensive piece. These have large reversible plates which seem to last most users a long time. These come in at a mid tier quality where you will notice that the grill plate is of good quality. These include a glass ﻿﻿lid which is awesome. It’s the only type I’ve seen with a glass lid. The lid helps with the evenness by keeping the heat trapped inside. There are often vents on the side to keep food moist, so don’t worry about dryness. The grease trays are generally large and located under the suspended griddle plate. This allows any and all overflowing grease to be caught underneath. It is then easily removed and cleaned. In fact, the entire piece is easy to clean. If this is not the case with the grease, then the piece is not worthwhile. This tier tends to be bulky, so storage is a potential problem. For its price, these are at the top of my list for best electric griddles under 100 dollars, because these griddles offer you everything you need and more. The basic detachable aluminum griddle is one of the cheaper electric griddles. It will only cost you around 20 to 30 dollars, but that comes with a price. 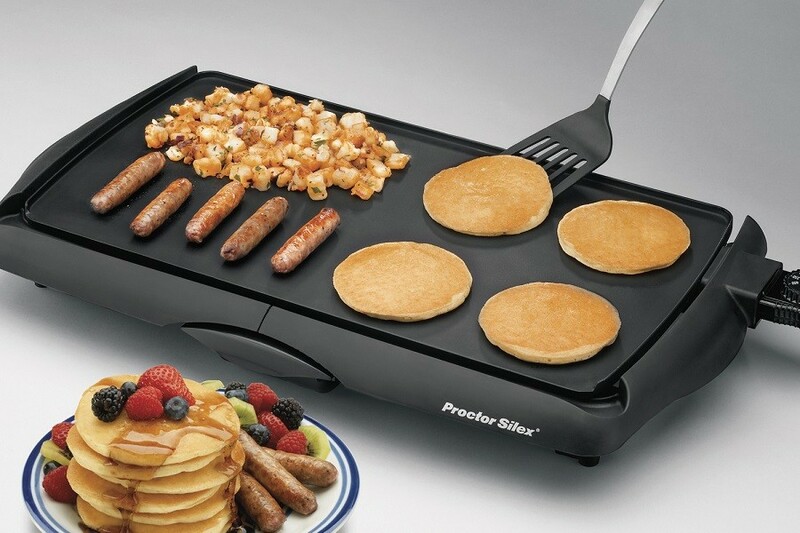 If you really don’t plan on using your griddle much, then you may as well go with this lower tier of griddle. It’s generally aluminum and has a heavy base. For a couple of uses it will be perfect. If you think you will use your griddle more than 100 times, you may need to pay a little bit more money. For its price, these griddles are amazing. They will focus on a very large skillet that can easily fit 8 pancakes at once. They are very simple and basic. This category emphasizes removable handles that make the griddle extremely easy to clean. You will usually just pull out the handles, and then you can clean the entire plate easily. The heating is fast, but not always perfectly even. There are hotspots, and mostly located near the temperature control. You can’t expect perfect craftsmanship for this price range. They will claim the heavy aluminum cast is warp proof, but the same cannot be said about the actual cooking surface. Reports of extended long term use show that it will eventually bend towards the middle making it impossible to cook eggs. It’s the same across brands at this level. The basic ceramic models are also priced around 30 dollars. Instead of being aluminum like the previous tier, these electric griddles are ceramic. Many brands will claim to have some patented ceramic coating which is allegedly designed to last 4 times longer than its metal counterpart. I have personally found that these ceramic coatings do not chip as easily as the metal ones. Unfortunately, this lower tie does not have master craftsmanship. It will likely come with a warming tray which, while a good idea, is never perfectly executed. After a while, the warming tray will likely melt in place and become unusable. The top grill will still be effective, but it will not last as long as more expensive ceramic griddles. The coating is going to be PTFE and PFOA free, so there are no chemicals to worry about. 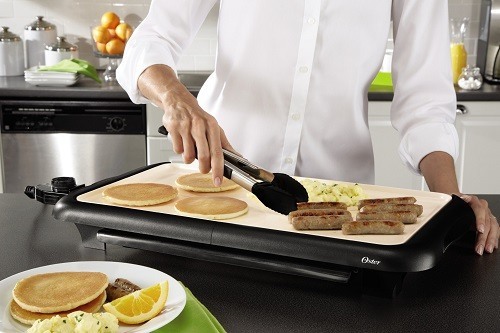 This ceramic electric griddle is also scratch resistant, which is a nice cosmetic addition. The temperature control is generally easily removed which makes cleaning very easy. The mid tier aluminum is a slightly better version than the previous aluminum tier. It is also about 10-20 dollars more expensive. It is another simple griddle style. It will have a large surface that is a little better than the other class. It will bend and warp less. The best feature for these is the tilt ‘n drain feature. The tilt ‘n drain feature handles the grease overflow problem well. It means the back legs can boost up, putting the entire griddle at a tilt. This makes cooking meats like bacon much more manageable as all the grease will flow down into the grease removal tray. All you generally have to do is pull the handles (or some lever) out and the griddle will tilt downwards. When you need a flat surface again, all you have to do is push the handles back in. For just around 40-50 dollars this is one of the better value tiers. They are efficient in price and relyon gravity (which is free by the way) to fix the grease problem. They won’t perfectly cook even, but that’s what you get at this price. The dual plate reversible grill is the cheapest dual threat on this list. It will range from 40 to 60 dollars, which is a great option for all its versatility. It will have two plates which are both reversible. 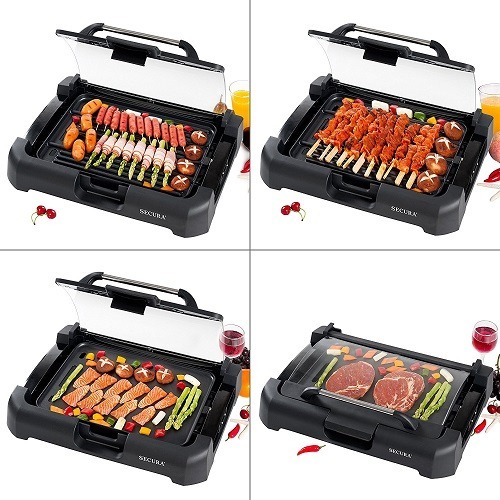 This means you can grill two separate dishes, griddle two separate dishes, or even griddle and grill at the same time. You are essentially getting an indoor grill and griddle for less than 60 bucks. Instead of one large plate, these electric grills use two smaller plates. The smaller plates are less susceptible to bending and warping. What’s also great is that each plate has it’s own temperature control which means you can slow cook on one side while rapidly fryin on the other. The two plates are often separated by a grease channel which all grease is directed to. The grease than flows into the grease plate which is removeable. If you don’t clean and watch for grease overflow, the dual plate nature can be an issue. Overflowing grease in the center will flow overboard and destroy the electric controls. Some are stainless steel electric griddles. The premium hybrid coating is the most expensive type of griddle on this list. It will likely cost you just under 100 dollars. It’s also one of the best on this list. They really invest in quality with the premium electric griddle. There aren’t additional features besides possibly a cheap backsplash. This griddle tier isn’t even reversible. Instead, the premium hybrid class has a high quality metal base and ceramic coating. 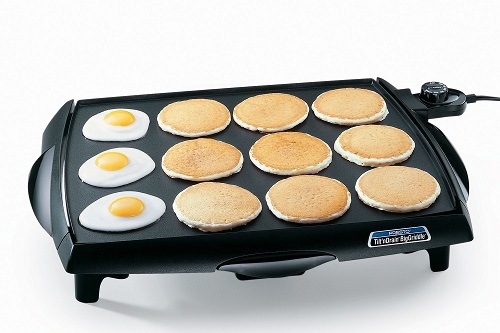 It combines the best of different griddles to make the perfect breakfast cooking device. It is the most flat and even cooking griddle on this list. It can be smaller but also it can have a giant 21 by 12 inch cooking surface, which can easily cook the entire family a meal at once. It will definitely come with a rear leg lift design that makes grease run-off much easier. The heat should be adjustable up to 425 degrees, and it will self regulate. Unlike many other models, this tier should not have hot spots. You will find more confidence at this level and even find griddles with a 2 year warranty. None of the other tiers will come with such a warranty. So if you don’t need a grill but instead want the best quality griddle for under 100 dollars, this is your best bet. Just don’t use a splash guard. It’s unnecessary and will only warp into an awkward shape anyways. This is the tier of ceramic griddles that includes both ﻿﻿﻿griddle ﻿﻿﻿and grill capabilities. It is similar to the previous ceramic electric griddles, but with much higher quality. The ceramic coating is generally thicker and intended to last 4 times longer than metal tops as well. I have not found these models to flake or peel. It is much smaller than other griddles, and can’t fit the same family sized meals as the previous models. It comes in just around 80 dollars usually, but they are loaded with versatility. If you are mostly cooking for yourself and at max one other, the advanced ceramic electric griddle is a great buy. It is of high quality, and its main drawback is size. The grease channel should be located under the plate, just like the aluminum models. The grease must flow down naturally, and the grease plate needs to be very large. One problem is that the drip plate is not washer friendly. These are not terribly difficult to clean, but they could be easier. If you don’t plan on cooking for many, but still want a fantastic quality electric griddle, than the advanced ceramic electric griddle is the best electric griddle for you. The Ultra Large is massive. It will cost you the same as the advanced ceramic above (around 80 dollars), but it does not come with a grill attachment. 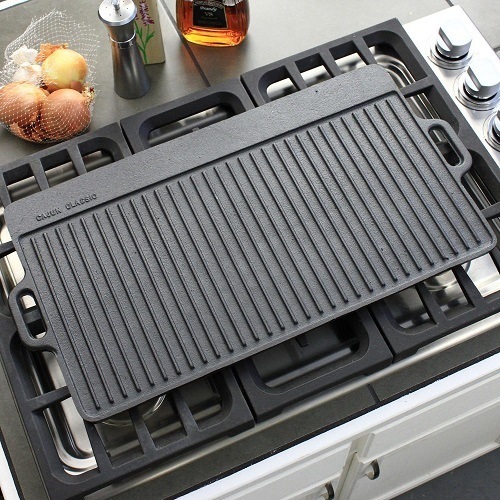 Instead, the ultra large electric griddle offers you a maximum 21 by 12 inch cast surface. The cast aluminum will be thick and great quality. It aims to be very flat and to cook evenly. These surprise with quality for their size. You would assume such a large piece would be difficult to evenly cook on, but the ultra larges generally cook very well. You can easily cook your entire family a meal at once on this piece. The non stick coating is more tough than other aluminum versions. It does not fade like many other pieces do. They should last you much longer, specially if it's a commercial electric griddle. 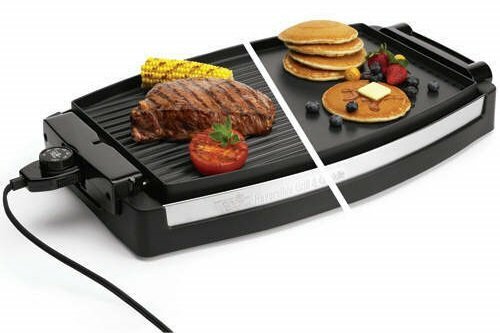 If you occasionally like to do giant breakfasts, or just need a skillet for your large family sunday breakfast tradition, then the ultra large electric griddle is the best electric griddle for you. It has all the quality and all the size. It won’t have many extra features like a lid or a grill top, but it will cook you a mean breakfast. It may even have the rear leg lift design, that can tilt your grill so grease runs down easily. This is one of the smartest designs to have in a griddle, because grease is the biggest element of wear and tear in your griddle. What are you looking for in an electric griddle? Think about how many people you want to cook for, how often you want to cook, and how well you want your food to be cooked. The only other criteria is the money you are willing to spend. Griddles are a bustling market. When you have answered all of these questions, the best electric griddle will come to you. The list above provides you with a wide variety of griddles, and if you know what you are looking for one of them is sure to fit the bill. They aren’t the only ones however. They are here to give a good idea of different classes and versions. Use your knowledge of griddles now to actually buy the best griddle for you. Most of these griddles will offer an option for a 2, 4, or even 8 year warranty. These will cost just a few bucks generally, and if you are buying a lower quality griddle they may be worth it. If you are buying a high quality griddle, they may save you from getting stuck with a lemon. The last thing to know is that you need to clean your griddle. Some are better made for this, but all of them can be cleaned. Whichever griddle you end up going with, know that it’s longevity will be affected by proper maintenance. So what are you waiting for? 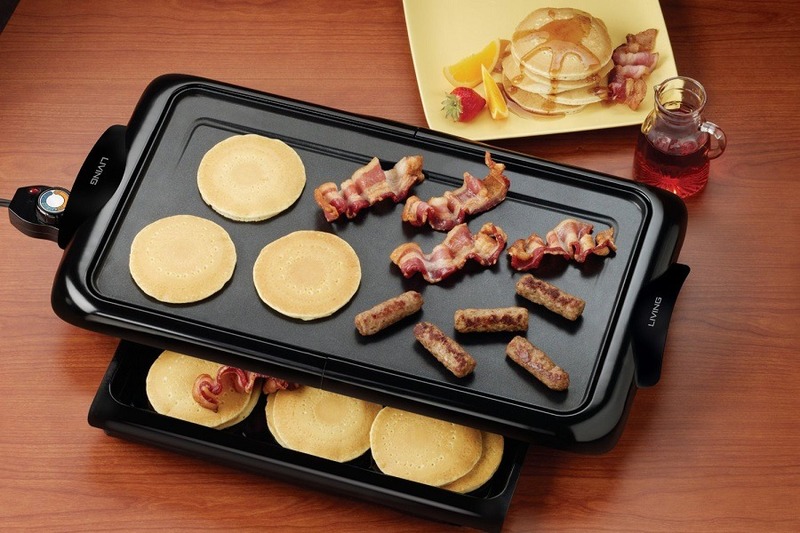 Go online or check your favorite local retail store and pick up an electric griddle today. After all the research you’ve been through, you sure deserve some bacon and pancakes.